Here I am, originally uploaded by Cpt<HUN>. Oh, baby! Have we got plans for you! Dressage shows with "breed" or "in-hand" classes are finding new popularity in the young horse divisions, thanks to some national year-end awards, and classes for foals means that babies' feet and legs and gaits will be under scrutiny this summer. And just last week, Dressage at Devon, the penultimate competition for warmblood and dressage-aspiring breeds and individual competitors, announced the addition of an in-hand (obviously) championship for foals. The division championship, sponsored by Hassler Dressage, will be a part of the event’s extensive breed division, which takes place September 23-25 in Devon, Pennsylvania. Dressage at Devon markets itself as "the highest rated international dressage competition and most complete breed show outside of Europe". Olympic medalist Robert Dover calls Dressage at Devon “the standard by which all American horse shows should be judged.” There is no question that a ribbon won at the show is a gold star on a horse's resume, to say nothing of potentially adding to a price tag. Weanlings have been shown previously at the event, but there was no specific championship for foals. In 2007, the prize list had 20 fillies and 35 colts listed as entries; there are classes for yearlings too, of course. There was a winning colt and a winning filly, but the champion young horse award meant that the babies had to compete against older horses. The organizers and sponsor say they want to be more like the Germans. Showing a foal in Germany is serious business, all part of the overall marketing emphasis of the breeding industry there. The foals are prepped to showcase their gaits, and promote the stallions who fathered them. We will just have to wait and see if there is a big demand for Equinalysis or OnTrack gait analysis of foals, and if trainers become obsessive about trimming tiny feet. Yes, show-quality foals have trainers, or at least professional handlers on show day, as a rule. Dressage at Devon will attract the very best dressage-bred foals in the United States. The question is: Will this top show's increased spotlight on foals feed a surge of interest around the country in micromanaging the feet and legs of warmblood foals, and analyzing their gaits, so they look good in the ring as weanlings...or so they move better and stay sounder as adults? Are the two mutually exclusive? Time for a commercial! Speaking of foals: Hoofcare and Lameness's special "Baby Boom" back issue is one of the very best collections of articles ever published on foal conformation and foot/limb disorders in foals. We can dig one out of the vault and send it to you; cost is $15 each plus $5 post for 1-3 copies to USA addresses; rest of the world, add $10 additional postage. Email books@hoofcare.com with your name, address, phone, email and Visa or Mastercard information or fax to 01 978 283 8775. Veterinarian Phil Tripp, left, with assistant Alfonso Quintero, work at the Churchill Downs racetrack in Louisville, Kentucky. Photo by Bill Luster, The Courier-Journal; story link below. Racetrack veterinarians were under the gun last week at the Congressional sub-committeee hearing on racetrack drug abuse and breakdowns. Reading the transcript makes it clear that owners and trainers were seeking to place some of the blame for the problems in horse racing on the shoulders of racetrack vets. To paraphrase one recent comment by a racetrack old-timer: "Years ago we had twice the horses and half the vets. Now we have half the horses and twice the vets." Racetrack veterinarians have always had a separate reality. Unlike most veterinarians, they are bound by laws and rules and have to be pharmacologists to know how long a medication will remain in a horse's system, what the allowed levels are, and what the implications may be of a horse shipping to a different state where laws may not be the same. Ever wonder how it's possible to stable fillies and colts next to each other on the shedrow? Ask the vet. There are two types of veterinarians at the track: practicing vets and regulatory vets, who are employed by the racing jurisdiction, usually the state. In addition to tasks related to testing horses for illegal or excessive medication, veterinarians inspect horses before races, interact with stewards, and work double-duty when an outbreak of herpes virus or strangles shuts down a track. Veterinarians at Churchill Downs in Louisville, Kentucky found a willing ear in reporter Jenny Rees of the Louisville Courier-Journal. Her compilation of their comments and more hits against track vets formed a feature story in today's paper. Read it here. It seems like blame for everything in the horse world is like a big game of Tag. This month, track vets are It. Tomorrow it could be you, or me. Big Blame keeps getting passed around and around; where it stops, nobody knows. Favorite Photos: Which Way'd He Go? horse hoofs, originally uploaded by Miss-D80. Which side of the right front shoe do you think he wears down most? I bet most Hoofcare and Lameness readers could draw a picture of what the bottom of this horse's right front looks like. Draft horses are amazing. I think this is a draft horse, or possibly a Friesian. They often endure bad shoeing, no shoeing, lousy confirmation, cracked feet, ringbone, sidebone...and just keep going. Thanks to Miss D80 for the loan of her photo! Now here's something I haven't seen before. This Shire is crafted from hundreds of horseshoes by retired Yorkshire, England businessman Donald Punton. Click here to learn more about him and the horses he builds. I think the blaze and feathers paint is really clever, although I am not sure if the body and legs are painted or just rusted! The continuing education of racetrack management continues this summer, as a full card of bulldozers will break through the gate of lovely Santa Anita racetrack in Arcadia, California. The learn-as-you-go plan is to completely replace the year-old Cushion Track artificial surface with a brand new Pro-Ride surface from Australia. The Cushion Track surface was installed over questionable drainage systems and malfunctioned this winter, cancelling racing on several days when the winter rains hit the track east of Los Angeles. Santa Anita Park announced today that its main track will undergo a complete overhaul beginning July 14, and will be reconstituted with a mixture of Pro-Ride synthetic. The project will include completely removing the existing asphalt base, adding a new grid base material, and treating the entire track with binder and fiber. It is anticipated the complete project will take six weeks to complete. During this period of construction, there will be no training at Santa Anita. Santa Anita’s new Pro-Ride synthetic surface will debut with the beginning of the Oak Tree at Santa Anita meeting on Sept. 24. The 25th Breeders Cup will be run at Santa Anita October 24-25; it will be the first time that the Breeders Cup has been run on an artificial surface. Racing officials and hierarchy are putting lots of faith eggs in the artificial surface basket, with permanent installations completed this year at all major California tracks, joining Keeneland and Turf Paradise in Kentucky and other tracks around the country in the experimental switch from dirt to fiber. The hope is that the surface will be safer for horses and more consistent. Several Breeders Cup races are run on the turf and will not be affected by the surface switch. Hoof-La Update from Dutrow: "It Still Wasn't the Loose Shoe"
Smoking Gun? The article in this week's Blood-Horse about Big Brown's loose shoe in the Belmont, shown in this closeup from a Russ Melton photo, has now been posted on the web; you can read the entire article by clicking here. Dutrow added that the shoe appeared to have spread and that it was pulled, along with his other shoes, the next day. His horseshoer still had to use his pulloffs to get the shoe off, so "loose" is a relative term. He also said that there was no pain reaction when the foot has worked on. Dutrow also verified farier Tom Curl's report that Big Brown is now shoeless and jogging at Aqueduct, presumably enjoying a rest from all the hoof-la that attended his Triple Crown lameness issues. Also, the toe grab in this photo is completely legal in New York. No states that I know of have banned toe grabs on hind feet. The Jockey Club's model rule change suggests toe grabs other than wear plates be eliminated on front shoes but there are no rule changes suggested for hind shoes, where toe grabs are standard equipment. What Can a Loose Shoe Do? Remember Longfellow! There's an expression, "Safe and Sound" that can be extended to the work that horseshoers do for their four-legged clients. They believe that they put on shoes to help horses run faster, jump better, raise their knees more (or keep them lower), to get traction on ice or on a smooth turf-y jump course. But they also do their very best to make them safe. They check the nails. They check for loose clinches. They come back for a hot nail. They rasp off any sharp edges. You might think they are making it look pretty, but what they are really doing is keep that sound horse safe out there on the road, track, course, field, or arena. One of the very most famous stories of a horse with a loose shoe in a race goes back to 1872. The great champion Longfellow was to run in the 2.5 mile Saratoga Cup against a longtime rival, a horse called Harry Bassett. The 1872 New York Times record of the race begins with this dramatic sentence: SARATOGA, July 16. Never, perhaps, in the racing history of the Saratoga or any other track has such a scene been witnessed as took place today the scene attending the race between Longfellow and Harry Bassett. On the way to the post, Longfellow's shoe came loose. The race was off, and at the halfway point, he lagged uncharacteristically behind. His jockey went to the whip; it was the first time the champion had ever felt its sting. He accelerated and almost caught his rival; he lost by only a length, and the record was broken for that distance. When Longfellow pulled up, it was on three legs. The loose shoe had bent over double and was embedded in his frog. One report said he had puled off the heel of his foot. He had kept on running, and almost won. But he never raced again. Of course, Longfellow's shoes were steel and Big Brown's are a very lightweight aluminum alloy. But that story does drive home the lesson that a loose shoe is a dangerous situation. Big Brown's shoe was obviously loose...but not that loose. He was lucky. And today, a jockey would be wont to pull up a horse before the damage was done, but go to the whip as they did in 1872. Photo links to ESPN's article on hind shoe revelation. "His feet are ice cold, quarter crack not an issue. He had a very loose hind left shoe, but that’s not an issue." Now we are left to wonder: did anyone check the right hind? This week's Blood-Horse shows a loose shoe on what looks to be Big Brown's right hind foot...and the photo was snapped early in the race. Please read the article on ESPN.com, and also go back and re-read the Hoof Blog's original post about the loose shoe. The Blood-Horse expose of the loose shoe is in the mail and will probably show up on their web site at some point. The report of a loose shoe was a grave concern to me when I heard about it; some of the farriers I talked to were also quick to state that that might have been a problem, particularly with traction in the deep track. They were more concerned by a loose hind shoe than by a patched front foot. But the Big Brown camp dismissed hind shoes as having played any role in Big Brown's uncharacteristic performance in the race of his life. 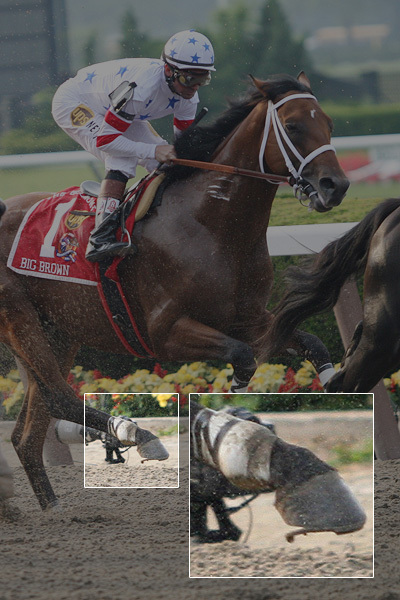 I know that someone out there will say that the closeup photo is showing a turndown style of hind shoe, but turndowns are not allowed in New York racing rules and the horse would have been spun before he even got to the paddock. I also interviewed farrier Tom Curl, who rebuilt Big Brown's fickle feet in Florida this winter. Tom was with the horse after the Belmont. He did not consider the loose shoe to have been a performance limiting mishap when asked about it. Of course, we'll never know what happened to Big Brown that day. The colt's not talking. Each year, planeloads of American tourists land at London's Heathrow Airport and head off on their pre-packaged tours of the London sights. A tour of the Tower, a peak at Buckingham Palace, a stare at Big Ben as he chimes the hour. And in the evening, there's the obligatory tickets to the great theaters of London's West End, where plays like Phantom of the Opera got their starts. The theater district that brought us (for better or worse) Andrew Lloyd Weber, and where theater is...well....theatre. They even spell it differently. It's the real thing. Tomorrow the Americans will board tour buses and head off to Stratford Upon Avon or Windsor Castle, but tonight, playbills clutched in hand, they settle in their sacred seats to the best London thespians have to offer. They've paid through the nose, so this better be good. No. Not "Hair" but "Hoof". The new play at the Lyric is described thusly: "A pony’s owner is growing up fast and TV has taken over from riding. When the remote control is unexpectedly dropped within hoof-reach, the horse’s lonely life takes a new tack. Her secret, night-time viewing reveals cowboy films and amazing adventures. She begins to realise she’s not just a dumb animal and a quest for a herd, humour and a life without shoes begins…"
The pony's story is enhanced with puppets, tap dancing hooves and nostalgic TV clips of Black Beauty and Champion the Wonder Horse. That's right, barefoot hoofcare promoted from the stage in London. Tap dancing without horseshoes might not have the same effect. Note: there's also an improv theater company in Liverpool called Hoof! so this can be confusing! If anyone has seen this play, please check in! Here's a statement issued today by International Equine Acquisitions Holdings (IEAH), the partnership that is part owner of Kentucky Derby and Preakness winner Big Brown. The statement comes on the heels of a Congressional hearing held Thursday in Washington DC in which House committee members were highly critical of lax drug policies (among other things) in US horse racing. This is the first announcement of this sort that has been issued, although there are probably racing stables and/or trainers who have similar policies without stating them. Remember that medication rules vary by state. For many years, New York had a much tougher medication policy than other states. Today, it is legal to race horses on steroids and other medications in most states. The Jockey Club has been promoting a nation-wide ban on steroids by the end of this year, by the issuance of a model rule that would be adopted by individual states. They also have issues a model rule change outlawing any traction devices or toe grabs on front shoes. However, no one has the power to force a state to change its drug or horseshoe regulations. "In an effort to re-build confidence and the integrity to the great sport of Thoroughbred horse racing in North America, IEAH Stables is proud to announce effective October 1 all horses in training and racing in IEAH silks will run only with Lasix. No other medication, drugs, or steroids will be administered. "While regulatory standards and indeed legislation may be required to resolve most of the controversial issues surrounding our sport, we believe our announcement today is a step in the right direction. To the best of our knowledge, we are the first racing stable in North America to make this commitment. We encourage others to follow our lead. "We have selected an effective date of October 1 as the official "free-of-medication" withdrawal date because our horses should be clear of all substances by that time. As of October 1, we will request all tracks at which our horses run to perform pre-race and post-race testing at our expense. These procedures have proven effective under racing conditions outside North America. "Moreover, in the interest of fairness to the wagering public, we will request and strongly urge that race programs include data indicating which horses will run with medication, which will run free of medication. The programs should also indicate which owners/trainers decline to divulge this information. "As a further test of our commitment, beginning October 1, if any of our runners test positive for medication other than Lasix, we pledge to donate our share or purse money to charities related to thoroughbred horse racing. We will specify those charitable organizations at a later date. "We believe this change is for the betterment of our sport. In the long run, it will benefit all involved in the game -- the tracks, horsemen and most of all the fans." An interesting footnote to this story is that Benny the Bull, owned by IEAH, won the Golden Shaheen, a tough international race in Dubai this fall. Dubai racing has a zero tolerance for medication and the Dutrow-trained horse managed to win impressively in spite of the drug ban, international travel, and searing desert heat, as did 2007 Horse of the Year Curlin. IEAH's October 1 deadline means that their horses, if entered, would not run on medication for the 2008 Breeders Cup to be held in California later that month. A press release from the Jockey Club yesterday calls for immediate action to change front shoe regulations of racehorses immediately. The edict was a result of research completed in the past few weeks by the newly appointed Thoroughbred Safety Committee. Recommendations from the Committee will be reviewed by individual state racing commissions, who have the authority to adopt, adapt or reject the recommendations. An immediate ban on toe grabs (other than 2-millimeter wear plates), turn downs, jar calks, stickers and any other traction devices worn on the front shoes of Thoroughbred horses while racing or training on all racing surfaces. The Association of Racing Commissioners’ International (RCI) and all North American racing authorities to implement this ban by rule as soon as possible, but no later than December 31, 2008, and for all racetracks to consider immediately implementing this ban by “house rule” in the interim. Previous recommendations from the Grayson Jockey Club's Welfare and Safety Summit had included a model rule banning toe grabs greater than 4 mm; this recommendation was developed and passed at at the Racing Commissions International (RCI) Convention in April 2007, but is subject to adoption by individual states. Several states, including California, adopted that recommendation. The new policy advisory is much stronger, since it lowers the toe grab from 4 millimeters to effectively eliminating it except for the wear plate seen in the toes of most flat shoes and outlaws the use of mud calks, jar calks, and stickers. Turndowns and bends (angling the heels of the shoe toward the ground) are normally seen on the hind feet, as are most toe grabs and traction devices. The Jockey Club policy advisory only addresses traction on front shoes. Additional advisories recommend elimination of steroid anabolic medications in the race training and racing of Thoroughbreds no later than December 31, 2008. The Thoroughbred Safety Committee includes chairman Stuart S. Janney III, and members John Barr, James G. (Jimmy) Bell, Dr. Larry Bramlage, Donald R. Dizney, Dell Hancock and Dr. Hiram C. Polk Jr. Each is a member of The Jockey Club. The Welfare and Safety Summit includes a Shoeing and Hoof Care Committee, chaired by Bill Casner of WinStar Farms. The committee has been actively working on creating more information about racehorse shoes and their effects on horses and their interaction with different surfaces. Read Tuesday's complete press release here. Uwe writes by email today, "Now i have a little bit for smile. My daugther is 6 years old and she trims her pony self. I give her only supporting how much and where she trims. 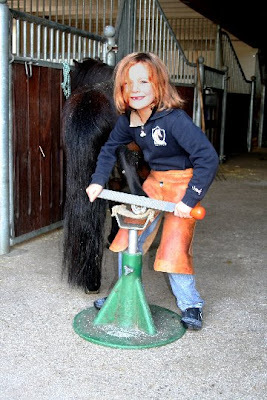 She knows, she will be a Farrier and a Vet in the future. I think it's changing sometime more." If the stable in the background looks a little elaborate, the Lukases liven in Warendorf, home of the state stud for the Westphalian breed and the national equestrian federation. A lot of Olympic gold medals have gone home to Warendorf. Uwe's English is a lot better than my German, but I am sure you can get the idea of what he's saying. I think I have some matchmaking to do. On this side of the Atlantic, we have Robbie Pethick, the handsome son of New Jersey farrier Bob Pethick, who has taken on trimming a horse, not a mere pony. Robbie will be six in August. They already have something in common--note that they are both using HoofJack hoof stands! Both of these youngsters also have a great advantage if they learn from their expert farrier dads, each of whom shoes some of the very top dressage and sport horses in their respective countries. Father's Day for me was tinged by the memorials on television here in the USA this morning for the superb television journalist/interviewer and one of my professional heroes, NBC's Washington bureau chief Tim Russert. Tim was much more than a reporter and host of the "Meet the Press" tv show, as evidenced by his larger-than-life camera presence and his recent stints on the bestseller list with his book Big Russ and Me, about growing up under his father's influence in the gritty US city of Buffalo, New York. Tim died suddenly this week. In the spring of 2004, I published a book about my father--about the lessons I have learned from him, the way he has influenced me, and my enormous love and respect for this steady, hardworking, and modest man. My publisher sent me on a publicity tour in the hope that people around the country would see the book as an ideal Father's Day gift. Early in the tour I was in Chicago, where to my great relief, customers were lining up to buy the book and have me autograph it. What happened next really surprised me. "Make it out to Big Mike" somebody told me, which was followed in rapid succession by, "This is for Big Mario"..."Please inscribe it out to Big Manuel."... "For Big Irv."... "Big Willie"..."Big Stan"
I had expected that my book would appeal to readers in my home town of Buffalo, New York, but I didn't know whether the story of a young man coming of age in a blue-collar Irish-Catholic neighborhood, whose father was a truck driver and a sanitation man, would strike a cord with a wider audience. I (soon) discovered there were many Big Russes out there--good, industrious, and patriotic men who have a lot in common with my dad, even if they didn't share his religion or his heritage. By writing a book about my father, I was affirming not only his life, but the lives of many other fathers as well. I am sorry that I never had a chance to ask Tim to inscribe a copy to Big Joe. Casino Drive's Feet, originally uploaded by Rock and Racehorses. Racing is full of "What ifs" and there were probably echoing off Casino Drive's stall walls when Big Brown failed to fire a week ago in the Belmont Stakes. Casino Drive was visiting from Japan with the sole purpose of stealing the Belmont from Big Brown. He certainly stole the Peter Pan in a very dramatic run for the finish line a few weeks earlier, but a bruised foot caused his connections to be cautious and skip the Belmont instead of poking and prodding and poulticing and patching the colt's foot. Meanwhile, my friend Sarah Andrew (a.k.a. "Rock and Racehorses") tracked the poor horse down to take photos of his feet for this blog. I wonder what the Japanese team thought of her pointing the camera not at his handsome head but at his feet and knees? Can someone tell me about this shoe? My friend Xavier took this photo...it was on a display board and is not an antique shoe out of a museum. I have a theory, what's yours? And can someone explain why and when you'd want to double-fuller like that? It would be a good forging test to get the arcs parallel; this farrier did a good job. A smooth arc on a single crease is an art...but parallel ones? Maybe one of the British farriers can tell us if there is a name for double fullering. However, this is not a British shoe, as far as I know. Leaving a comment to explain your theory about this shoe is easy: scroll to the bottom of this post and click on the word "Comments". A new window will open. Type your comment in the box on the left. On the right, click on "name/url" and a little box drops down. (Or at least it does on my Mac with a Firefox browser.) Type your name or nickname in the box marked "name". Then hit either "preview" to look over what you typed in the big box, followed by "publish comment". And you're done! If that's too much to ask, you can email your comment to me and I will post it for you. If you have a Google or Gmail account and are signed in, you can ask the blog to automatically email other comments about this shoe to you so you can respond to people who respond to you. The Hoof Blog has a new policy of moderating comments, by the way, since some people have been getting a little edgy and maybe a little too presumptuous of my laissez-faire attitude, so it may take a little while before your comment shows up on the blog until I approve it. And if you don't like horseshoes, please don't feel obliged to preach to those who do. Just wait til there is a subject you do like. Let's accentuate the positive, my friends. There's plenty of hoof to go around. The New York Times is reporting this morning that Rick Dutrow, the trainer of Kentucky Derby and Preakness winner Big Brown, will testify before the United States Congress next Thursday when a special House of Representatives Subcommittee on Commerce, Trade and Consumer Protection hearing on “Breeding, Drugs, and Breakdowns: The State of Thoroughbred Horseracing and the Welfare of the Thoroughbred Racehorse” will be held. The Subcommittee is investigating the reasons for the deaths of so many racehorses recently, spurred by the double-breakdown of the filly Eight Belles who finished second in the Kentucky Derby and was euthanized on the track. Others who will testify, according to the New York Times, are Richard Shapiro, the chairman of the California Horse Racing Board; Arthur Hancock III, the owner of Stone Farm outside Lexington, Ky.; Jess Jackson, the owner of Stonestreet Stables; Randy Moss, the ESPN analyst; Alan Marzelli, president of the Jockey Club; and the trainer Jack Van Berg. Additional witnesses may include Susan Stover, the director of a veterinary research laboratory at the University of California at Davis; Larry Soma, a professor at the University of Pennsylvania’s New Bolton Center; Dr. Mary Scollay, the Florida state veterinarian who has been hired as the equine medical director of the Kentucky Horse Racing Authority; Dr. Wayne McIlwraith of the College of Veterinary Medicine at Colorado State; and Alex Waldrop, the chief executive of the National Thoroughbred Racing Association. Dutrow is likely to face questions about the use of steroids in racehorses. He recently admitted that Big Brown, like all his horses, was given monthly injections of a steroid called Winstrol. Dutrow reportedly said he didn’t know what the drug was or what it did. He told the Times that he might take his veterinarian to the hearing with him. Let’s hope the hearings are on C-Span. Audio web-casting will be available if you have a Windows Media Player installed in your computer. MSNBC Salutes Molly, the Three-Legged, Dog-Bitten, Katrina-Surviving Wonder Pony! To launch the video, just click on the "play" icon. It will play right in the blog window. As marketer of the book MOLLY THE PONY, Hoofcare and Lameness is tuned in to the story of the spunky little New Orleans pony who survived being abandoned in a collapsed barn during Katrina, didn't die after an attack by pitbulls, and finally, made a huge comeback from rare amputation surgery that left her hobbling around the bayou on three legs. Molly has a safe new home now, and a new job in life as a therapy pony visiting hospitals and schools. And we have a hit book on our hands! Enjoy this little video about Molly, and thanks to everyone out there who helps ponies and horses like her! Molly is giving back a lot to the world that saved her life, more than once. Thanks also to the Soft Ride hoof boot company, for their donation of a support boot for her "good" front leg. So far, Molly has not developed laminitis in the 18 months since her surgery, but we do want to keep it that way. Donations of products and techniques to keep her comfy or offer support are most welcome; Molly now has her own tax-deductible charity, called "Kids and Ponies". To order a copy of Molly's book, go to Molly's web page on hoofcare.com. This quarter crack repair uses the lacing technique rather than the sutures used on Big Brown. Photo taken at a demonstration by Dr Scott Morrison of Rood and Riddle Equine Hospital in Lexington, Kentucky. In the run-up to Saturday’s Belmont Stakes, everyone was counting the years. It’s been 30 years since we’ve had a Triple Crown winner. It’s been 35 years since Secretariat won the Crown. But since the Belmont was really more about quarter cracks and the big bad feet of the favorite than much of anything else, let’s count some other years. Did you know it’s been 44 years since the “invention” of the modern quarter crack patch? 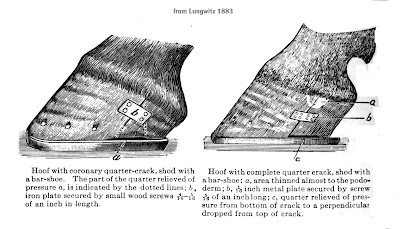 Farriers have been stitching and clamping quarter cracks together for well over 100 years now, but a unique “modern” quarter crack patch was patented in 1964 by an enterprising Los Angeles racetrack horseshoer named William R. Bane. In January of 1964, the US Patent Office awarded him a patent, #3,118,449, to protect his secret method for repairing hooves of Thoroughbred and Standardbreds so they could race again. And win. It was enough of a big deal to be written up as a headline story in the New York Times. Bane’s plan had been to train others at racetracks around the country, much like a franchise, but he ended up spending a lot of time on airplanes because owners and trainers wanted him to personally patch their horses. Bane’s patented secret turned out to be to cover the crack with a synthetic rubber called Neolite, a material very popular in the early 1960s for rubber-soled shoes, which were quite a sensation at the time. In 1962, Bane was called east to work on Su Mac Lad, who at that time was the world’s all-time high-money winning trotter. It took Bane eight hours to patch that crack, but Su Mac Lad was training the next day and raced a week later, and went on to be horse of the year, with a patched hoof. That was unheard of; a quarter crack usually meant several months at the farm to recover. 8. finish the patch to conform to hoof wall contour. Fiberglas soon gained popularity over rubber, and then in the 1990s, PMMA adhesives came along for rebuilding walls and covering cracks after they were dry. The patching was always done sort of secretly, with the materials and technique being a closely guarded personal formula. 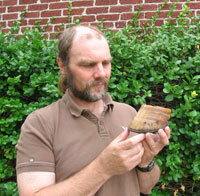 In the mid-1980s, Dr Jud Butler claimed 100% success on 3000 cracks he had treated with fiberglas. Among those was the great Slew 'o Gold. The earliest book I have showing a patch over a crack is the American translation of Lungwitz’s text. Lungwitz was the great German professor of farriery at the University of Dresden. Lungwitz carefully distinguished between full cracks and what he called “coronary cracks”, similar to Big Brown's crack. He hot-seated the metal patch into the wall. His treatise on cracks is recommended reading! If you double-click or right-click or whatever your browser demands, on the image below, you should be able to see it in a larger size and read the captions. 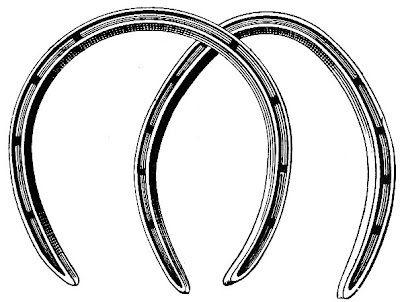 In 1897, Dollar and Wheatley, in the landmark text Handbook of Horseshoeing, gave recipes for creating artificial hoof horn from gutta percha (natural rubber) for covering cracks. They also listed as patching techniques: clips on shoes, metal plates with wood screws, rivets (which they said was the oldest remedy), Koster's sandcrack band (which sounds brutal), crack straps around the heel bulbs, linen tape used much as we use casting tape today, and a vise-like shoe that paralyzed the bars and preventing the crack from opening and closing. But, then again, he advises this aftercare for a quarter crack: “Before nailing the shoe to the foot, take fat pickled pork, (and) fill the bottom of foot with long slices thereof, pressing them wall into the commissures with the hand.” The foot was then bandaged with his secret salve, made from shoemaker’s wax, beeswax and mutton tallow. Yum. That has all changed now. We have big Quarter horse, Appaloosa and Paint halter horses with quarter cracks, and more than a few Warmbloods have chronic cracks. I had a photographer's epithany at a horse trial a few years ago, taking pictures of all the different types of crack patches, although steel plates were the preference for that rough sport. Tom Curl is one crack specialist who might turn up at the showgrounds or the racetrack on any given day. For those who doubt that Big Brown might be Big Again, or even Bigger Still, consider that an infected quarter crack kept the great champion Buckpasser out of the Triple Crown races in 1966. He came back and won just about everything, with 15 consecutive victories, setting track records and earnings records as he went. I should mention that 13 (by my count) of those victories where in the second half of 1966. Most horses today don't have that many starts in a lifetime. Buckpasser's owner, Mr. Phipps, did not opt to have him patched. Ultimately, the crack bothered the horse enough to warrant his retirement after one of the most successful US racing careers in history. His jockey, Braulio Baeza, told the trainer that the horse had had enough and was running on heart alone, not hooves. Buckpasser may have been a negative influence, in hindsight. By continuing to run with his crack, he showed that it was possible to keep going with a crack. He was obviously an exceptional animal. In the 1980s, the great Standardbred Nihilator raced with quarter cracks that were patched by farrier Joey Carroll. His heel was basically removed, and he wore a z-bar shoe. Breeders Cup winner Wild Again, now a retired successful sire at Three Chimneys, will recognize Big Brown's foot problem when he arrives at the breeding farm. In 1986, Dr Bill Moyer claimed to have worked on 74 horses with quarter cracks as a clinician at the University of Pennsylvania's New Bolton Center. That's more than six per month. He said that most were Standardbreds. Moyer received funding from Standardred leader Billy Haughton to study cracks. He loaded them in a vise and found that the crack closed when the horse was weighbearing, and sometimes even overlapped, which must cause a horse a lot of pain. Quarter crack repair is still a task best left to the experts. Done incorrectly, an imperfect lacing and/or patching job can seal in infection so that a major problem erupts or it could impede normal growth from the coronet, causing a hoof deformity. 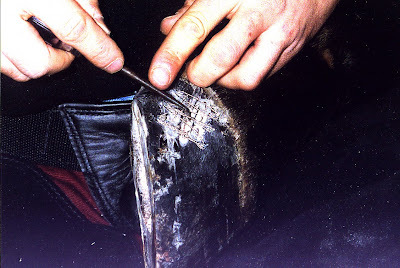 The goal of patching is a clean, dry crack growing out under a protective patch so that the horse is sound and painfree. I am fortunate to have a great library of new and old books, and files that bulge with notes and proceedings from the hundreds of meetings I've attended and farriers and vets who have shared their experiences and photos. In spite of the experts, in spite of the technology, and in spite of medications and great veterinary care, a quarter crack is still a debilitating injury to a normal horse. Perhaps for a superstar horse like Big Brown, with unlimited expertise at his beck and call, it is just a bump in the road. We'll find out. He'll have a file all his own in my library, that's for sure. Big Brown's Owner Says Loose Hind Shoe "Not An Issue"
The jockey complained that the horse was not handling the track well. Various reports from the media describe the track as loose and deep and suggest that the track was not watered because of the water pressure problems at the track yesterday (which left almost 100,000 racegoers without toilets). Much has been written about Big Brown's problem-packed front feet, but not much about his hinds. He won the Derby with turndowns on his hinds; turndowns are popular at Churchill Downs, according to crack specialist Tom Curl, who worked on Big Brown's right front foot. My guess is that all or most of the runners in the Derby also had them. A turndown is the practice of turning the heels of the hind raceplate down so they become, in effect, like mud calks. They are believed to help with traction. Big Brown's hind shoes were pulled after the Derby and he exercised and lived barefoot behind for a couple of days until Todd Boston, a shoer at Churchill, re-did his hinds. I don't know what he had on behind for the Preakness but I do know that turndowns are illegal in New York. They do allow a small bend, but no sharp angles, that's for sure. Fred Sellerberg is NYRA's man in the paddock; his job is looking at the shoes. The guy has some sort of x-ray vision and seems to be able to spot an illegal shoe before the horse leaves the holding barn. Or at least he says he can. He just nods his head and says, "Believe me, Fran, I can tell". He is roughly my age and does not wear glasses, so I'm impressed. Fred also would have seen a loose hind shoe. A paddock shoer, in addition to Fred, is on hand for exactly that reason and occasionally a race is held up in the paddock while a shoe is re-nailed. So a loose shoe was probably a function of another horse stepping on it during the race or the horse stumbling and grabbing, or just normal wear and tear in the course of the race. Big Brown hit serious traffic problems in the first mile of the race and one ABC commentator suggested that he may even have been kicked by Da'Tara as he came up too close and had to be pulled back. Watch the replay on slow-motion mode; at times it looks like Big Brown is a carousel horse, going up in the air, although still making forward progress. Even more likely is that it was pulled loose when Big Brown was yanked up by the jockey. There are some dismal photos of the horse in biomechanical disarray as the rest of the horses charge past him. I wonder how his mouth feels today. Tale of Ekati received a tough gash in the race and has a pretty serious wound on his leg, according to trainer Barclay Tagg. When Rags to Riches didn't come back after the Belmont last year, she was sent to New Bolton Center for a complete medical and orthopedic analysis, from head to toe. Coolmore (her owners) insisted. They didn't find anything wrong that was ever made public but the filly spent the summer hanging out in her stall. IEAH is the midst of building a new equine hospital next door to Belmont Park. Let's hope that they put their future staff to work checking out Big Brown so he can run again. If they are going to be in the equine health business this fall anyway, they can get a head start and protect the horse from further injury or illness if there is any doubt. What would the New York governor's great grandfather think of glueable Yasha shoes? New York Governor David Paterson has a lot of firsts to his credit. He took over the leadership of the state on March 17, after the resignation of then-governor Spitzer. Paterson is New York's first African-American governor and the state's first blind governor. What we didn't know until today is that he has piles of horseshoes in his past. While presenting the Belmont Stakes trophy to trainer Nick Zito, Paterson shared his family's horseshoeing connection. Paterson's great grandfather was horseshoer to the powerhouse breeder/owner H.P. Whitney, owner of Greentree Stud, in the years after World War I in New York. In particular, Mr. Gibbs shod a horse with the apt name of Upset. Upset would hand the great Man 'o War his only defeat, in August 1919 in the Sanford Stakes at Saratoga, with Mr. Gibbs' shoes on his hooves. Mr. Whitney, who just happened to be one of the wealthiest people in America, rewarded his blacksmith by buying him a house in the Fort Green section of Brooklyn. He also bought homes for some other members of his stable staff. As Paterson describes it, the new house helped lift his family to a new level of possibility in pursuit of the American dream. Without Whitney's generosity, the house wouldn't have happened. It was the house where Paterson spent his childhood. And it was a house that some very lucky horseshoes built. Thanks to the Left at the Gate blog and other sources for help in piecing together this story from Governor Paterson's remarks. No Triple Crown This Year: Big Brown was eased to finish last after a bumpy, unhappy trip for the first mile or so of the Belmont Stakes. That's assistant trainer Michelle Nevin, his regular rider, who ran out on the track to take charge of the horse. Photo credited to TIMOTHY A. CLARY/AFP/Getty Images. Jockey Kent Desormeaux stood up in the irons and pulled back and up. The race was over for his horse. They both knew it, apparently. He pulled up and cantered home last. In an interview later he is quoted as saying (referring to the patched hooves), “There were no popped tires. He was just out of gas." Did I miss it or were there no on-air post-race interviews with the IEAH power brokers who own Big Brown? Did they not congratulate the winners? I understand that it is the trainer's responsibility to be with the horse and make decisions about his health and care back at the barn. Winning trainer Nick Zito, one of New York's most popular and successful trainers, won the race with a long shot who ran an incredible race and just kept going. He deserved to be congratulated. Also to be congratulated: the Japanese connections of pre-race second favorite, the lightly raced Casino Drive, who is laid up with some sort of bruise on his foot. They chose not to poke holes in their horse's sole to drain the problem area. It probably could have been soaked, poked, and drawn out and then patched or glued. But kudos to them: they didn't take a chance with their horse. Dutrow took all the chances. His horse has a patch on a patch on one foot, the remnants of a reconstructed heel made out of adhesive material on the other. His horse missed his monthly Winstrol (steroid) injection in the face of criticism over the medication, even though it is legal (whether right or wrong, it is legal). He was running without the turndowns that he sported on his hind feet in the Kentucky Derby (note that the jockey complained that the horse wasn't handling the track well) and he was coming back from rundown injuries on his hind pasterns and heel bulbs suffered in the Preakness. And it was 93 degrees and humid. And his third race in five weeks. Big Brown's trainer took all the chances. The jockey chose not to take a chance, not to whip and drive the horse to a middle of the pack finish over the line with possible dire consequences in the final furlong in front of the grandstand. He did not know what was wrong with his horse. He just knew he was out of horse. Meanwhile, a horse we never heard of ran a great race for a great trainer at their home track in their home town. Pop the champagne anyway. We've just come off three months of high-profile reporting about horses' hooves, injured hooves, and the people who are trying to help horses get sound and stay sound. Hoof repair specialist Ian McKinlay is still the man of the hour and has made a lot of friends in the media that will benefit the rest of the hoof world. So pop the champagne, and I'll do the same. Maybe stay home tonight and watch some archival video footage of Affirmed, Seattle Slew, Secretariat, Citation, Assault, Count Fleet, War Admiral, Gallant Fox, Omaha, Whirlaway and Sir Barton. Enjoy the freak show, it's as close as you're going to get, for now. ESPN spent a morning with Tim Shortell at Belmont Park this week. Tim, a horseshoer on the New York tracks, explained the difference between low-toes, XTs, mud calks, etc. and shod a horse for the camera. Click here to go to the ESPN site to watch the video; sorry I can't post it here. Tim looks more like Clint Eastwood every day. Meanwhile, CBS News called Hoofcare and Lameness to track down Ian McKinlay, and once they found him, reporter Dr. Debbye Turner (she's also a veterinarian) did a weekend feature on the quarter crack specialist. They will be posting the video online. It's nice to know that CBS reporters and producers are reading this blog! 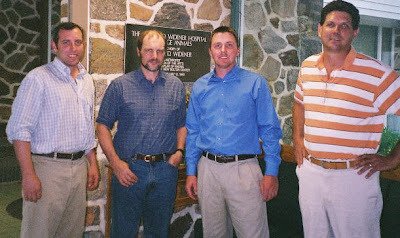 2008 speakers at the University of Pennsylvania's Technical Horseshoeing Conference: (left to right) Course organizer and UPenn resident farrier Pat Reilly; Dr. Jeff Thomason from University of Guelph, Canada; equine podiatrist Bryan Fraley DVM from Kentucky; hoof repair specialist Ian McKinlay of New Jersey. Technical horseshoeing covered a lot of ground at the University of Pennsylvania's New Bolton Center in Kennett Square on Saturday. From biomechanics to anatomy to podiatry and finally to 911-level hoof repair, speakers touched on many aspects of the scientific and practical bodies of information about the horse's hoof. Speakers zoomed in and out of the gray areas like the cars that would be passing me a few hours later on the way back to the Philadelphia airport. The morning began with introductions and an overview of the new laminitis research center (tentatively called The Laminitis Institute) at the University of Pennsylvania. Dr. Jim Orsini, associate professor of surgery at New Bolton Center and director of the Institute, explained the exciting new concept to the audience. Click here to read more about the Institute. Dr. Jeff Thomason lectured on the basics of foot biomechanics and the research undertaken in his laboratory at the University of Guelph in Canada. Included in his research was updated material on the finite element analysis modeling he has been working on, with beautiful graphic images. Later in the day, he spoke on the nuances of functional anatomy and the "design" of the horse's legs, with interesting images and challenges. Thomason (shown at left, looking at a hoof capsule, in a University of Guelph photo) enlivened his presentations by standing on dinner plates (illustrating that weight alone won't fracture a fragile object), then smashing it with a hammer (showing the effect of force being much more destructive than mere weight). It's not easy keeping an audience awake during a biomechanics lecture, but smashing dinner plates with a rounding hammer definitely set a new standard. 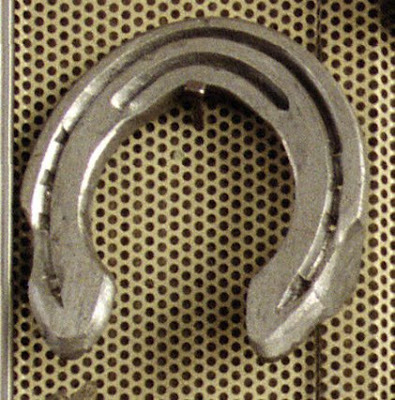 Interestingly, Thomason's biomechanics research on vibrational properties of horseshoes found that unshod feet actually showed an increase in vibrationi over shod feet of about 25 percent, but he felt that it was statistically irrelevant, other than as an anecdote for those who use vibration as a criticism of horseshoes. 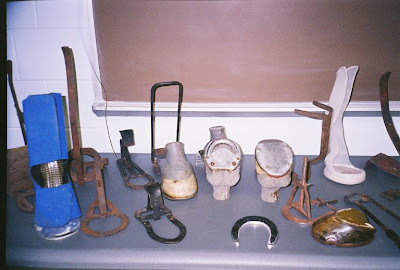 Conference leader Pat Reilly, who is now resident farrier at New Bolton Center, reviewed his use of high-tech measuring systems to question the probability factor of correcting what he feels are the universal malady of the horse's foot: underrun heels. According to a study quoted by Pat, as many as 60 percent of horses are affected by low-heel syndrome and he maintained that every foal he has seen has had underrun heels. He defines "underrun" at being as least five degrees lower than the toe angle, as set in stone by Tracy Turner DVM in published papers. Reilly contends that underrun heels is an irreversible condition in many horses and a variation of normal hoof conformation. 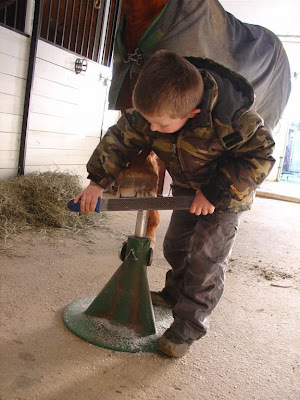 Kentucky farrier Bryan Fraley DVM reviewed a deep file of cases related to puncture wounds, foot infections and cracks. He took the time to delve into the nuances of poulticing the foot, which many people skip right over. A number of his cases fell under the heading of "digital instability"--an apt moniker! New Bolton Center has one of the best collections of antique horseshoes in the world. They were crafted in the 1800s by resident farrier and "professor of podology" Franz Enge, a German immigrant who was a disciple of the world-renowned Professor Lungwitz. At this end of the display are some modern braces and support devices for orthopedic cases. 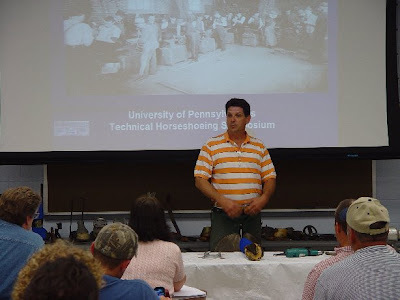 On the second day, New Jersey farrier Bruce Daniels shared insights into the lovely antique shoes in the University's secret vault of farrier treasures and New Zealand native farrier Trevor Sutherland worked at the forge with attendees. Hoof repair specialist Ian McKinlay escaped from the mobs of press at Belmont Park, where he had been working on Triple Crown hopeful Big Brown, to drive down to Pennsylvania and speak at the University of Pennsylvania's Technical Horseshoeing Symposium on Saturday. Yes, he did show Big Brown's week-old quarter crack, which is sutured (not patched over) in a way I had not seen before. Hopefully, I can post some photos soon. McKinlay acknowledged that that farrier world "is trying to move forward" but gave evidence of progress on several fronts, such as the loosening of the Belmont track after Big Brown's trainer, Rick Dutrow, complained that it was too hard. "Times slowed down," McKinlay said, "and people were saying, 'Hey, nice cushion'!" He asked the audience to help him list the disadvantages of glue on shoes and went on to explain more about Big Brown's abscesses and their consequences. He bemoaned the practice of leaving the bars lower than the walls, saying that this led to the prevalence of sore heels in racehorses. This conference's goal, according to Pat Reilly is "to present scientific information relating to hoofcare"; "to describe techniques for managing hoof-related pathologies"; and to "create an atmosphere of open dialogue between New Bolton Center and the farrier/veterinarian community". Those are all lofty and worthy goals. As with all such undertakings, the hardest step is the first one. By re-establishing this conference on the worldwide hoof science calendar, the University of Pennsylvania has the potential to add a valuable platter of substance to a table often overloaded with appetizers and desserts. Canker in Hoof, originally uploaded by krissid2001. I can almost smell this photo right through the computer screen. And it doesn't smell good. Have you ever seen a horse with hoof canker? I've only seen it a few times, but it certainly made an impact. I know that this is becoming more of a problem in horses in the USA, and people are reporting more cases all the time. The problem is that many owners don't recognize what it is and rarely contact a veterinarian until it is so advanced that you can see it (and smell it) from across the paddock. Another problem is that it often strikes draft horses, like this Clydesdale or Shire, so the feathers cover it. If you see something ugly growing on the bottom of a horse's foot, either in the cleft of the frog or the sulci or in the heel bulbs, don't just assume it is a bad case of thrush that will go away when the pasture dries up or when summer comes. Canker often requires the services of a consulting vet or farrier and horses are sometimes put down because of it. Medications and soaking and diligent cleaning are all on the list of treatments. Thanks to Krissid2001 for allowing me to blog this photo for you all.